Don't bash drama cast & crew and any member of Soompi. Do not post illegal streaming links. An upcoming Wednesday-Thursday drama from OCN has confirmed several of its cast. “Hand: The Guest” tells the story of a psychic, a priest, and a detective who solve bizarre crimes that occur throughout Korean society, banishing the evil in people’s hearts through a combination of Korean-style exorcism and shamanism. Kim Dong Wook will play the lead character, Yoon Hwa Pyung, born with psychic powers. He uses his powers to act as a shaman and has a strong commitment to exorcising evil spirits, but his free-spirited nature hides a dark heart. Kim Jae Wook plays Choi Yoon, a cold and cynical priest whose strong will and sense of evil make him an ideal exorcist. However, he shows little emotion and drives people away with his unapproachable personality. Jung Eun Chae plays Kang Gil Young, a detective in the serious crime squad, whose passion and laser focus on the job at hand put veteran male detectives to shame. She has a tough but easygoing personality and does not believe in the supernatural, though she soon gets embroiled in the world of exorcisms when she meets Choi Yoon and Yoon Hwa Pyung. “Hand: The Guest” is expected to premiere sometime in September. I'm hoping KJW to be the lead for for that One Million Stars Falling From The Sky k-version but.. it's okay. I get to see this terrific actor again and in an OCN drama. I already like his role.. you tsundere! [Orion's Daily Ramblings] Kim Dong-wook, Kim Jae-wook, Jung Eun-chae and Park Ho-san Join OCN's "Hand"
I choose to have dramamnesia over my past experience with the writers of "Hand"
, because this cast is to die for and I want to enjoy it in its full glory. 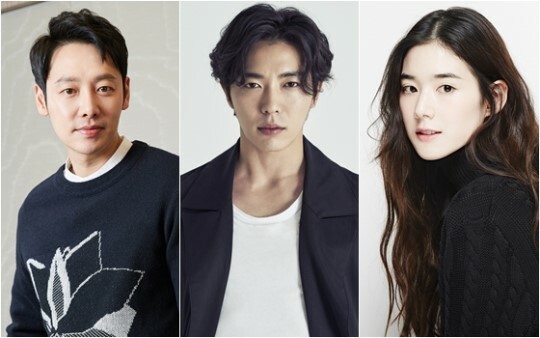 Kim Dong-wook, Kim Jae-wook and Jung Eun-chae have officially accepted their roles as the three heroes of OCN's upcoming exorcism-themed drama "Hand", also known as "Hand: The Guest", while Park Ho-san has also joined them. The character information is pretty much as we've seen reported before on the two heroes, as well as the heroine. Kim Jae-wook is Choi Yoon. He is the cold, cynical priest, who is skilled, but who alienates people. Jung Eun-chae is Kang Gil-yeong, the fiercely dedicated, but warm and caring detective. She doesn't believe in the supernatural, but she gets involved in exorcism affairs with the other two. We do get a bit of an ominous change with Kim Dong-wook's Yoon Hwa-pyeong, however. The psychic, who no longer appears to be a detective as originally reported, has an easy-going personality. Underneath it, though, he is hiding darkness. I mean, The Evil™ will do that to you. Can't have a man who can sense it without trauma. Park Ho-san plays Go Bong-sang, a detective working alongside Gil-yeong who is also her uncle figure. "Hand" will be airing in September, and that means we have plenty of time to hype this up in our minds. I'm hoping that the writer duo will redifine themselves, and that they and PD Kim Hong-seon-I will make a good team. Just look at this cast and premise. I'm weak, I tell you! Weak! 3. [+130, -5] Wow 11 years after 'Coffee Prince'...Seriously...Kim Dong Wook x Kim Jae Wook, I'm going to watch it live!! I hope this will be as dark as 'Save me'. I know. dark psychotic mysterious. It's kinda Constantine. And the cast.. I only Kim Jae Wook and that's enough. I like his character. Sounds so tsundere. Hah. @RPM thanks for the updates. Of course I'm gonna watch this as always I watch almost all the dramas of OCN. How many episodes for this drama? NO information about no. Of episodes but I think 16 . Me to love to watch OCN dramas and Kim jae wook is my love❤ and Park hae jin too . After the awesomeness* of life on mars, I'm keeping an eye on future OCN dramas. I also like some other OCN dramas eg. black, bad guys, voice and tunnel.